I have not seen something this exciting for a while. 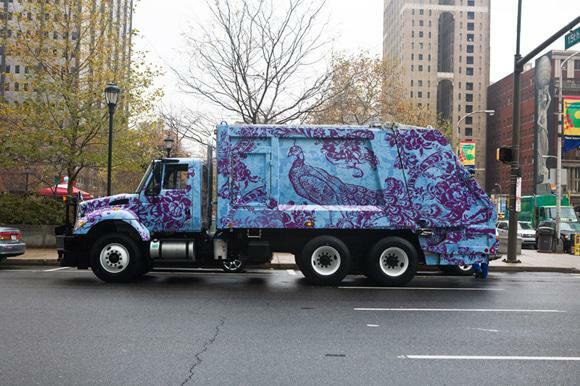 Philadelphia’s Mural Arts Program partnered with the Design Center at the Philadelphia University to wrap 10 rubbish trucks with bold graphics inspired by historic textiles collections. By doing so they introduced the students to textiles from around the world – a class I would have loved to attend. To read more click here. I wish all rubbish trucks looked like these. The service that these trucks provide beautifies our cities so why not make them beautiful? This entry was posted in Blog and tagged arts project, beautify, city, Design, philadelphia, Rubbish, rubbish truck, Students, textile, Truck. Oh this car looks good!Nice drawings!Really cool! We should make all city vehicles look this cute. I’ll bet the drivers are even in good moods driving them around town. I would be! Oh wow, can you imagine proteas and other indigenious flora on our ugly trucks and trains…hm, what a cheer on a grey day. that’s really cool. you’re right – they should do this on more garbage/rubbish trucks it would really make it seem less dreary.